This morning on my walk, I said hello to my down-the-street neighbor, Pete. 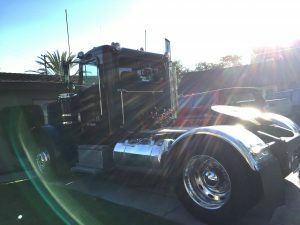 Pete must be in his late seventies, has lived in his house longer than I’ve lived in mine (25 years), and he still drives a semi-truck cab that he owns (his name is on the side). It hooks onto an enormous 18 wheeler which is rarely on the street these days but has been known to make random appearances. The cab, however, lives in Pete’s driveway where he drives it off somewhere almost every day, and now that he’s semi-retired, he washes it some mornings instead. I first met Pete about 18 years ago because his grandchildren, it turned out, went to elementary school with my children, and they would visit him. A weird coincidence considering that my children went to school about 10 miles out of our district. And then I noticed him because he began sitting on his front porch every morning before work and every evening after driving the cab back home. Just sitting on the porch at night in his rocking chair with a six-pack. He is a man of little words. Gruff but friendly. A large man with a beer belly who fits the trucker stereotype. And as far as I can remember, he looks pretty much the same now as he did when I first met him back in the 90s. So imagine my surprise when I was walking by Pete’s house this morning as he was washing the cab and heard the haunting strains of Ella Fitzgerald’s classic Someone to Watch Over Me. It was so incongruous. And so unexpected. Which I admit, was very biased of me. And it got me to thinking about other people who have surprised me over the years when I learned something about them that was at odds with what I thought I knew about them. Like a man at the center where I work who is doughy and phlegmatic. It turns out that he writes and performs pretty harsh rap on the weekends. The first time I heard it on YouTube, I was shocked. And there’s a woman I work with who loves dubstep, but you would never guess it from the very soft and feminine way she presents herself. And then there’s my friend who’s covered with tattoos from head to toe, is in a Hell’s Angels club, rides a Harley, and is an avid flower gardener. Appearances are sometimes so deceiving, aren’t they? I guess the most surprising thing about me that people discover is that I square dance. And I like to wear the petticoats. And now that I don’t teach, a lot of people are pretty surprised to discover that I have a Ph.D. But no one who really knows me is surprised to find out that I gave birth to my daughter in the very bedroom I still sleep in. Do people still do that? What do we really know about our neighbors and our co-workers? Mild-mannered reporters by day… Thinking about all this makes me realize just how deeply ingrained and sometimes unfair my preconceived notions about people probably are. It’s not that I judge one way or the other; they just defy my expectations. But often in a good way. I think it’s awesome that Pete listens to Ella. Next time I think I’ll stop and listen a little longer. I love when people surprise me. I bet truckers have a broad range of musical interests because they must listen to so many hours of music on the road… But I’d sure love to know what Pete would tell you about why he likes that song! And yes, petticoats ARE great. I used to love dressing up with Mom’s square dance skirts. It was about the only girlie thing I really liked.